The all-new Critiki has been up for almost a week now, and ooh de lally, I’m happy. It takes a little getting used to (for me, too), but I hope you’re enjoying the new site. (Haven’t seen it yet? Go check it out.) I’ve been spending the last week continuing work on some mostly-invisible things that didn’t need to happen before the launch (e.g., all of the behind-the-scenes admin areas that only I see, and some manual massaging of the pictures to work in the new layout). For this tour, I’ll use screenshots from the desktop, but all the same features are available on your mobile phone or tablet. The site detects the size of your screen, and if the screen is small, some of the features show up differently. For instance, “Nearby Tiki” is at the lower left on a desktop computer. 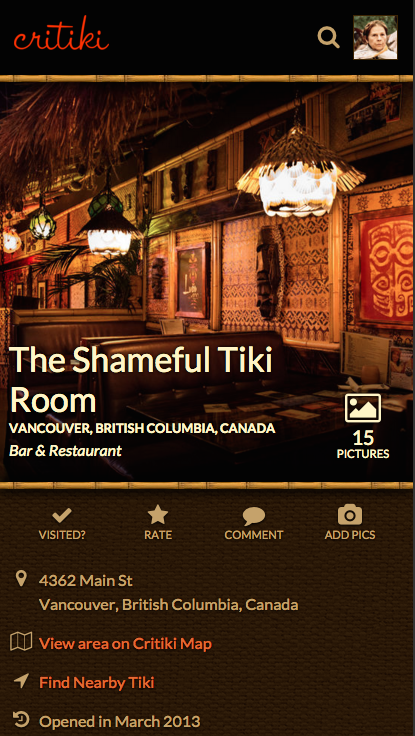 On your phone, a “Find Nearby Tiki” link brings up a modal with the exact same content. Clicking this Pictures icon brings up a gallery of thumbnails of all of the pictures of this location. Click any one of those thumbnails, and you’ll get a full-screen view of the picture. You can move through the pictures using the right and left arrows on your keyboard. You can zoom in! It’s pretty fancy. On a mobile device (or any other touchscreen device), it has all the swipey, pinchy moves you’re used to. When you’re looking at a picture, the URL in your browser window updates to be a link to the picture you’re seeing—that means you can share a link directly to a specific picture. There’s even a handy link in the upper right corner for sharing a picture via Facebook or Twitter. This bar is just below the main image on every location page. These next four features are available to Critiki members only. It’s free and easy to sign up! Check off the places you’ve been, and mark the places where you’re a regular (or semi-regular). If you’re a regular, you can optionally add the time you’re most likely to be found at your favorite places. This adds you to the list of “Regulars & Visitors” for this location, and also adds the location to the list of places you’ve been on your Profile page. These are *not* ratings of the Shameful Tiki Room, just demonstrating the sliders in different positions. This is where you add in your detailed rating of your experience at a location. Check out those groovy tiki head sliders! If there are any aspects of the rating you want to leave blank, you can just leave the head all the way to the left. 1 is low, 10 is high. Use your voice: add a comment to detail your experience, or share a bit of knowledge about a location. Critiki would be pretty dull without the pictures, eh? Share pictures you’ve taken (or scans of your postcards, napkins, matchbooks). This feature got a lot of love in this update, it’s much easier and faster to add your pictures now. If you like dragging and dropping files, you can drag and drop a picture file right onto where it says “Click to add a picture”—I don’t mention that on the form because I didn’t want to drown you in words. The behind-the-scenes area where I review and approve the pictures is getting a big upgrade, too, which should make the review process happen faster. These ratings are made by Critiki members—people like you!—who have been to this tiki location. (An exception: locations that are of historic interest are rated solely on their “Former Glory” and can be rated by anyone, to help gauge the long-term impact a spot has had on tiki culture.) The aspects vary from location to location (for instance, stores may be rated on “Product Quality,” and aren’t likely to be rated on “Drink Quality”). Click the “Detail” arrow at the bottom of the ratings window to expand and see how the location has scored across the various aspects—and to review your own rating, in case it needs updating. The “Nearby Tiki” section on the left side of the page (or in a modal, if you’re on a small screen) lists the five closest tiki locations to this location that are open to the public, with distances noted (as the crow flies, not miles of actual road you’d need to travel). The “View area on Critiki Map” link (found just under the street address) will bring you to the map, where you can see the surrounding area, including any home bars or tiki locations of historic interest. (These historic, closed locations are worth looking at if you’ll be visiting: you’ll know what to keep an eye out for at the local antique malls!) The list of locations on the map is whatever is currently visible on the map—to see more, zoom out or pan around. Any articles in Critiki News that mention this location are shown, to the left on the desktop or toward the bottom of the page on mobile. Just below this is where you’ll find comments, where your fellow Critiki members have shared their experiences in a bit more detail. Here’s where I do my bit to summarize the location, and help you figure out how you’ll get there. The detail here varies, sometimes I know a lot and sometimes I know only a little (and sometimes, I just haven’t yet gotten around to doing a good write-up). A nifty new detail: if the description has a link to another location, when you hover over the link you’ll now see a preview of that other location, including a picture and its current overall rating. Whee! That has me feeling pretty fancy. Many of the tiki locations in Critiki are ones that are no longer operating. These locations have a black HISTORY ribbon in the corner of the main image. I’ve tried to make it more obvious which locations are no longer operating, to save you the heartache of thinking a great classic old joint is still around. Rather than be a bummer about it with the word CLOSED (and also to be clear that it’s not a business that’s just closed right this very minute, but will be open later today or tomorrow), I’m going with the word HISTORY. It also gets right to the heart of why Critiki has these places: they’re interesting! Don’t cry because it’s gone, smile because it happened, blah-blah-barfy-sentimental-meme-message. In all seriousness, these are my favorite locations in Critiki. They are what inspire us to go bigger, bolder, better with tiki today and are worth lots of study.